This weekend marks the start of the 2015 Formula 1 season. Wooo hoooo, the wait is over. New to Formula 1 but keen to learn more? You've come to the right place. 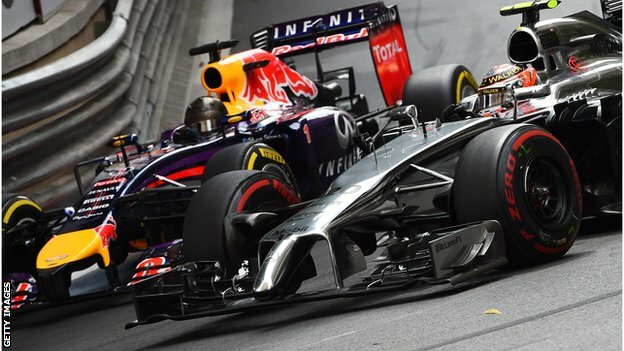 BBC Sport has compiled this handy F1 guide to answer all your questions about the 2015 season. There are 20 races in 2015, starting in Australia on 15 March and ending in Abu Dhabi on 29 November. The winner of each race receives 25 points, with the lowest-scoring position - 10th - receiving one point. A race weekend consists of three practice sessions, qualifying and the race itself. On Fridays (Thursday in Monaco) there are two 90-minute practice sessions, with a 60-minute session on Saturday morning ahead of a 60-minute qualifying session on Saturday afternoon. In Q1 drivers have 18 minutes to clock a fast time. On a 20-car grid, as will be the case in 2015, the five slowest cars are eliminated once time runs out and will start the race in the final five places on the grid. In Q2 times are reset and the remaining cars participate in a 15-minute session with the aim of recording a time that will secure their place in the top 10. The five slowest cars are eliminated and fill places 11 to 15 on the grid. For the final part of qualifying, Q3, times are once again reset and the remaining cars have 12 minutes to clock their fastest possible time as they compete for pole position for the race, as well as the remaining nine places on the grid. The race itself cannot exceed two hours, unless it is red-flagged - stopped because of an accident or poor track conditions. In such circumstances the total duration of the race and any red-flag stoppages cannot exceed four hours. All F1 cars use tyres from a single supplier - currently Pirelli - who have a range of four dry-weather compounds. These are super-soft(distinguished by red sidewall markings), soft (yellow markings),medium (white) and hard (orange). Two of these are selected in advance of a race weekend by the supplier, determined by the characteristics of the track. The harder of these two tyres will be given the designation prime, with the softer of the two designated as the option. Both the prime and option tyre must be used during the race, unless it rains and one or both of two wet-weather compounds are used. These are know as the intermediate (with green sidewall markings) and full wet (blue). In total, each driver is provided with 13 sets of dry-weather tyres, four sets of intermediates and three sets of wet tyres across a race weekend. At the start of the race, the cars that qualified for Q3 must be fitted with the tyres with which the driver set his fastest time during Q2. Since 2014, an F1 car's power has been provided by a 1.6-litre turbocharged V6 engine, which produces around 600 brake horsepower, with an additional 160bhp coming from an advanced energy recovery system (ERS), which converts mechanical and heat energy into electrical energy. Each car is limited to 100kg - or about 130 litres - of fuel per race andengines must consume fuel at no more than 100kg per hour. The aerodynamics of an F1 car have two vital jobs on the racetrack - producing downforce and limiting drag. Downforce pushes the car's tyres into the road and helps it travel faster through the corners, while reducing drag - the wall of air resistance the car disturbs as it races forward - and also helps increase straight-line speed. Every single surface of an F1 car can affect its aerodynamics and maximising efficiency is crucial to a team's success on the track. As a consequence, data is constantly examined and evaluated by teams throughout a race weekend as they look to get the edge over their rivals. Ten teams will compete in F1 in 2015. Each team names two race drivers for each round of the championship. They compete individually in the drivers' championship while their combined points go towards the team's tally in the constructors' championship. The driver and team with most points at the end of the season are crowned world champions. Lewis Hamilton is the current champion, his 2014 crown added to the maiden title he won in 2008. There are four other former F1 champions on the grid in 2015: Sebastian Vettel (winner in 2010, 2011, 2012 and 2013), Fernando Alonso (2005, 2006), Kimi Raikkonen (2007) andJenson Button (2009). Mercedes are the reigning constructors' champions after winning 16 of 19 races last season. Other previous constructors' title winners are 16-time champions Ferrari, nine-time winners Williams, and McLaren,champions on eight occasions. The Formula 1 World Championship, which began in 1950, was borne primarily from the grand prix motor races that became popular around Europe in the 1920s and 1930s. The first F1 grand prix was held at Silverstone on 13 May 1950, since when more than 900 races have taken place. The sport's first champion was 44-year-old Giuseppe Farina, while the winner of the first constructors' title (which was not awarded until 1958) was Vanwall. Michael Schumacher holds the record for most drivers titles (seven) and race wins (91) while Ferrari lead the way among constructors with 16 titles and 221 victories.